HBO stops filming horses in the racetrack drama "Luck" following the death of a third horse in connection with the series. 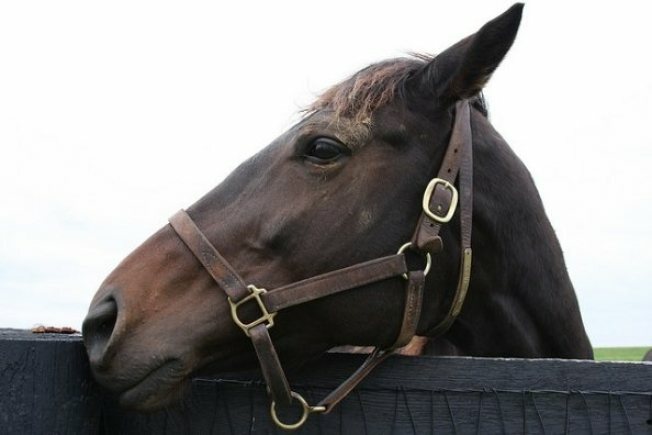 HBO agreed to suspend filming with horses after a third horse died during production of the racetrack drama "Luck." This is the third horse death in connection with the series. The animal was being led to a Santa Anita Park racetrack stable by a groom when it reared and fell back Tuesday morning, suffering a head injury, according to HBO. The horse was euthanized at the track, where "Luck" is filming its second season. The accident comes a day after after PETA said it sent a complaint to Los Angeles law enforcement urging the agency to investigate the deaths of two other horses, and humane group that oversees Hollywood productions had issued an immediate demand "that all production involving horses shut down." "We are also insisting that this stoppage remain in full effect pending a complete, thorough, and comprehensive investigation," the American Humane Association said in a statement. It noted that the accident didn't occur during filming or racing. In the series, which was created by David Milch ("Deadwood," "NYPD Blue") and looks at racing's seedier side, Dustin Hoffman plays a crime kingpin who's scheming to gain control of a racetrack and introduce casino gambling. During season-one filming in 2010 and 2011, two horses were hurt during racing scenes and euthanized. HBO defended its treatment of the animals, saying it's worked with the American Humane Association and racing industry experts to implement safety protocols that exceed film and TV industry standards. The American Humane Association's film and TV unit, the group sanctioned and supported by the entertainment industry to protect animals used in filming, called for a production halt at the Santa Anita Racetrack in suburban Arcadia after the second horse's death. Racing resumed after new protocols were put in place and proved effective, Karen Rosa, the AHA unit's senior vice president, said in February. An American Humane Association safety representative was at the track when the accident occurred and "as always, all safety precautions were in place," HBO said in its statement that said it was "deeply saddened" by the horse's death and was working with the AHA on its inquiry. Kathy Guillermo, a PETA vice president, said at the time the group didn't consider the matter closed. "Three horses have now died and all the evidence we have gathered points to sloppy oversight, the use of unfit, injured horses, and disregard for the treatment of thoroughbreds," Guillermo said.